In the northern reaches of British Columbia, in Western Canada, is an area called The Golden Triangle. There is billions of dollars’ worth of gold and other metals lying within this under-explored region. Today, I’m going show you two companies who hope to make fortunes there — for them and their shareholders. Mineral-rich Canada is filled with gold rush history, and The Golden Triangle has had at least three of them. The first was in 1861, before Canada was even a country yet. I think the next gold rush in the Golden Triangle is coming sooner rather than later. Gold rushes, and gold mines, in the Golden Triangle came and went. But two of the most famous are the Snip Gold Mine and Eskay Creek Mine. Snip was discovered in 1964 and went into production in the 1990s. It produced approximately 1 million ounces of gold from 1991 to 1999. The average gold grade was 27.5 grams per ton. Astounding! That’s nearly an ounce of gold in every metric ton of rock. However, there was a problem. The price of gold fell below $300 per ounce in 1999. And kept falling. With prices so low, Snip had to close. Eskay Creek meanwhile operated at around the same time. It became Canada’s highest-grade gold mine — grading 45 grams per ton. That’s nearly 1.5 ounces of gold per ton! Eskay was also rich in lead and silver, and grades of 2,406 grams per ton silver (77 ounces) it became the worlds’ fifth largest silver producing mine. It produced more than 3 million ounces of gold and 160 million ounces of silver. The company that developed Eskay Creek saw its share price soar from $1 to $67! Yowza! Anyway, both mines shut down because precious metal prices were too low. Also, there was very little infrastructure in the area at the time. Fast forward to today. There is a new paved road running through the Golden Triangle. And there is enough high-voltage electricity to power 20 mines. That would lower costs dramatically for any mine in the area. And those old mines left a LOT of high-grade gold and silver behind. So let’s look at two companies advancing projects in the area. 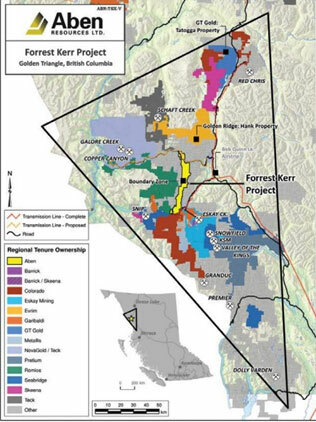 Skeena Resources (TSX-V: SKE / OTCQX: SKREF) is a junior company with a $25 million market cap. It now owns both the Snip Mine and Eskay Creek. Both of them! It’s a fascinating story with a lot of upside potential. Why haven’t you heard it before? Because Wall Street can’t see beyond the ends of its white-toed shoes, that’s why. Skeena is also riskier than a producer. So you have to balance risk vs reward. I have one more story for you today. It’s a company that does not have Snip or Eskay Creek. But it has a very prospective property right between those two past-producers. You know what I say: The two best places to look for a gold mine are either right next to a gold mine or in a past-producing mine. 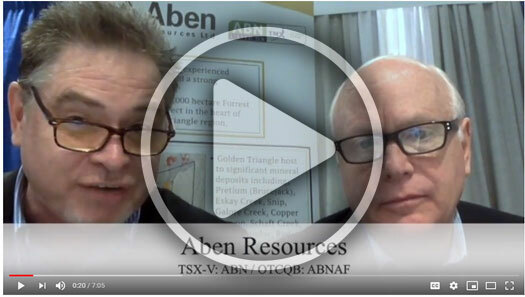 I’m talking about Aben Resources (TSX-V: ABN / OTCQB: ABNAF). It is tiny, with a market cap of just $17.1 million. Its flagship is the Forrest Kerr Project. It also has a couple other exploration projects elsewhere in Canada. So, it’s a small explorer. But some of the company’s drill results at Forrest Kerr are bonanza grade. It discovered what could be a rich system, and its highest grade zone so far is 331 grams per ton of gold over 1 meter. That’s within a zone averaging 38.7 grams per ton gold over 10 meters. They have some nice visible gold in their core samples, too. 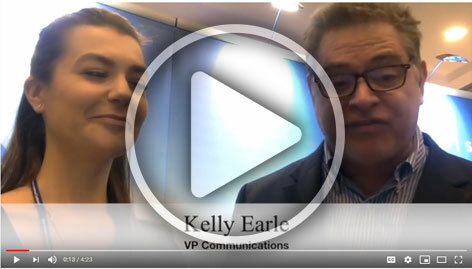 I got to talk to this company at the New Orleans Investment Conference as well. James Pettit is the President and CEO of Aben Resources. I’ll let him tell you the story. As Mr. Pettit explains, Aben is sharing the same infrastructure advancements that make Skeena look so appetizing. It should have news on drill holes coming out through December. We’ll see what happens. I find both these companies very interesting. I don’t own them now, but I may trade them in the future. Both Skeena and Aben are good examples of why The Golden Triangle is so interesting right now. Talk about a treasure hunt!